Well, a New Year has arrived and of course that means a new list for birds! We had not done “year lists” until we started here in 2012, because a few other Beat Writers had decided to and really…why not! We have had trip lists, garden lists, Christmas Day lists, etc. for more years than I care to mention and to do a year list is interesting. It makes you aware of how a “common bird” can elude you for days or weeks! Of course I then had to continue and so once again in 2013 I joined others in listing for the year and have just completed the third year in 2014. In Broome it is very easy to get 100 species on January 1st, which looks great for a while, but then you realise that before long other Beat Writers have jumped on aeroplanes and wandered further from home than we have. We have a whole continent here on our doorstep and maybe this year we will wander further, but it is too early to say and we will start the New Year with 108 species for the first day and see where we go from there! 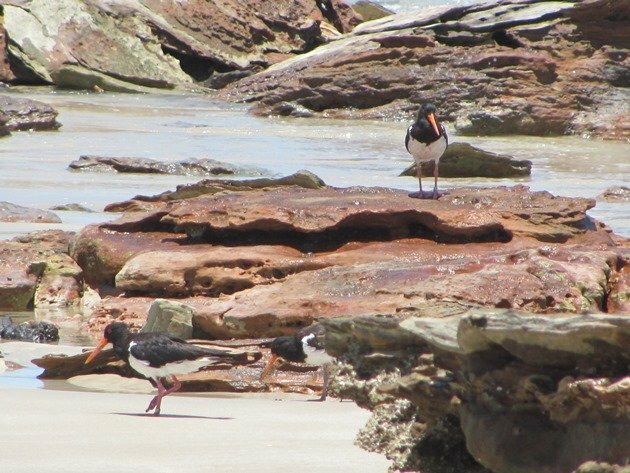 Firstly I would like to just do a little update on the Pied Oystercatcher family that were a large part of my life for the last few weeks of 2014. The last of the three juvenile Pied Oystercatchers was seen with its parents on Christmas day and a couple of days later it had finally gone on its way. 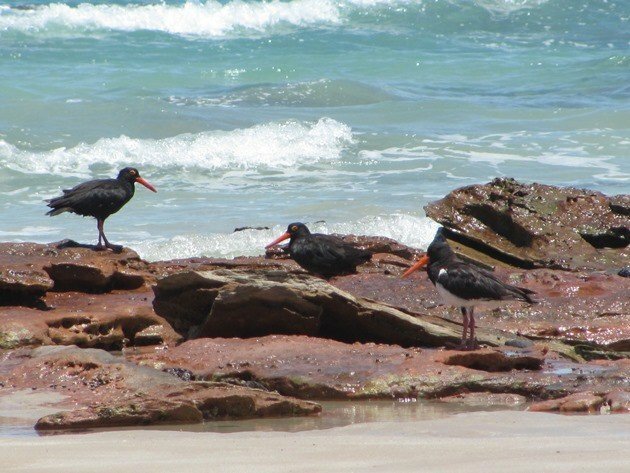 The adult Pied Oystercatchers were still at their non-breeding site at Gantheaume Point and will no doubt lay their first eggs for 2015 in the first week of July. I hope they are as successful this year as they were last year. We had thought we had completed our year list for 2014, until we had a surprise encounter with a Little Eagle on 28th December. We really thought that we had completed our list then, but on 30th December we had one more surprise. We had walked from Town Beach to the Port in the late afternoon and there were very few shorebirds on the beach due to the “low” high tide, but among them was a Common Redshank! 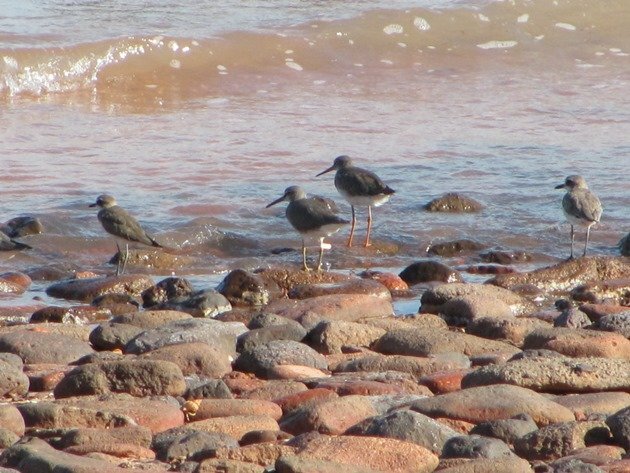 Now, a Common Redshank is just not a “common” bird at all here in Broome and it had in fact been several years since we had seen one. What a nice way to end the year! It was stood beside a locally marked Grey-tailed Tattler, which only carried a faded plain yellow flag and metal band on its right leg. The use of engraved leg flags over the past 11+ years indicates that it is at least 12 years old. Greater Sand Plovers stood on each side of the pair of birds. I will give you a bit of an explanation how a new-comer to Broome can maximise a day of birding around the town itself at the beginning of the year. A visit behind the Pony Club on the highway into town is a good place to find Little Corella, Black Kites, Whistling Kites, Golden-headed Cisticola, Nankeen Kestrel, Red-backed Fairywren, Gull-billed Terns, Australasian Pipit and Brolga if there is water. 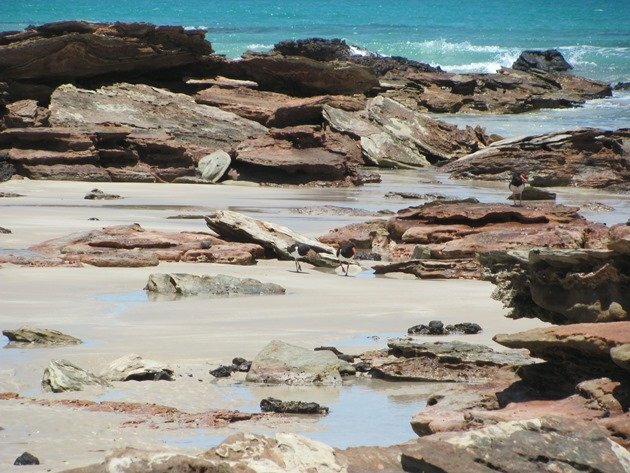 A visit to Cable Beach will soon find you some Silver Gulls, Red-capped Plovers, Red-necked Stint and Little Terns. Gantheaume Point is an excellent place to find a wide selection of shorebirds, though not in the large numbers that you get in Roebuck Bay. You will observe Sooty Oystercatchers, Pied Oystercatchers, Whimbrel, Sanderling, Ruddy Turnstone, Greater Sand Plover, Lesser Sand Plover, Pacific Golden Plover, Common Sandpiper and Grey-tailed Tattler. They are quite well camouflaged in the rocks and will often fly ahead if you are not aware of their presence. The Eastern Reef Egret grey morph is a lot more common around Broome than the white morph, but sometimes both are present. An Eastern Osprey nests in the lighthouse tower at Gantheaume Point, so always check that area for the species. 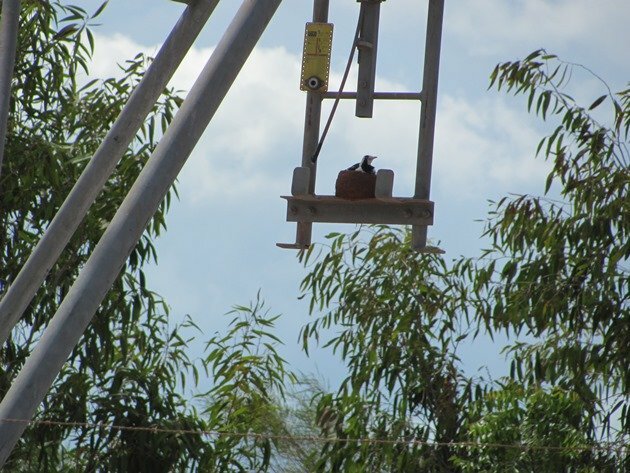 If the gravel road is open you can take that to the port area to look for Brown Booby and another Eastern Osprey nests on the wharf and also on the top of one of the fuel tanks near the port. A drive up to the clubhouse at the Golf Club can produce White-throated Honeyeaters if the trees are in flower and then you should head for the Poo Ponds off Clementson Street. The Poo Ponds are where you will add a good variety of ducks including Pink-eared Ducks, Pacific Black Ducks, Plumed-whistling Ducks, Grey Teal and Hardhead. Barn Swallows are often on the fence-line and Rainbow Bee-eaters. Australian Pelicans roost along with Royal Spoonbills and White Ibis and on the rock walls and you may even spot a Swinhoe’s Snipe in the grass if you are lucky! Eurasian Coot and Australasian Grebe are often present in one of the ponds. A visit to the public swimming pool is worthwhile, but not for a swim if you want to observe birds! You drive beyond the pool to the sports field and often there are Little Curlew there this time of year and also Eastern Yellow Wagtail. Masked Lapwings stand in the shade of the trees and Magpie-larks wander the area. In fact one pair has collected mud from recent rains and they have built a nest on the bottom of the ladder of the pylon in the car-park! Magpie-lark nest on a ladder! Right in town you do need to wander down Streeter’s jetty to find the Red-headed Honeyeaters, Dusky Gerygone, Mangrove Golden Whistler and Yellow White-eyes, but there’s no guarantee that you will get all of those species in one visit! After the ten species we had observed in our garden before we set off on New Year’s Day we were able to achieve 88 species just doing this loop around the town. 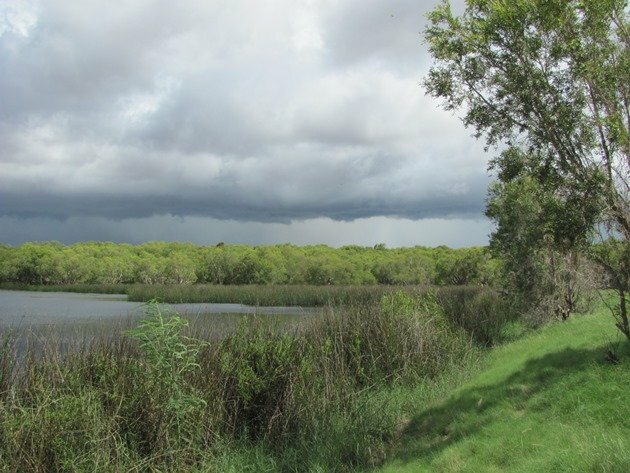 We then went out to a local clay-pan to find some species that we only find there, but it was the shortest trip we have ever made due to inclement weather. You don’t risk getting caught on a bush track when these weather systems are fast approaching! We did add 17 species, though, and then came back home with a detour into Morrell Park and found an Australian Magpie close to town. The late afternoon saw a Black-shouldered Kite fly along our back fence and the day was completed at 108! Weather to make you get out of the bush! If you do only have a short time in Broome you really can achieve a lot if you are making a bird list for the town and I hope that one day many of you will be inspired to visit. The most popular time for tourists is May to September, but the most popular time for birds (especially shorebirds) is September to May!! Once again for my Australian birds I will use the “Christidis and Boles 2008 key to species names” and list them in the order that they come on that list. 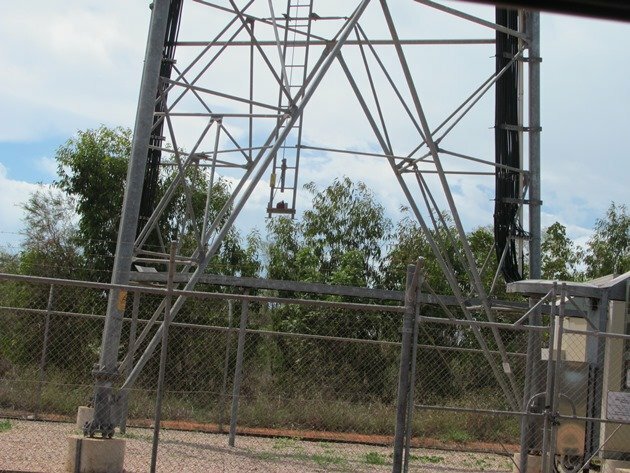 For birds listed as “seen in Broome” the location covers an area that is no further than 70kms from the Broome Bird Observatory unless otherwise stated. If there is a post that I have done that covers any of the species I will attach a link to it. For all my other posts you can click on Clare M. This was last updated December 3rd and my main goal is to have fun birding and list what I see. Temminck’s Stint–Calidris teminckii-Broome, November 29th-FIRST FOR AUSTRALIA! Wow, Clare, you have blown our minds with your 108 species. I had 11 species here around our mountain home in Eastern California. Thanks for the details on your day and hope you have a great 2015. Congratulations, Clare, your birding is absolutely spectacular! I got 24 my first day here on the Olympic Peninsula. What a wonderful start to your birding year! As of today, January 4th, I am only at 79 species. I really thought it would be more, since I am in Florida at the moment. Rest assured that my year list for 2015 will be much reduced from 2014! I like your goal, “to have fun birding and list what I see”. In fact, I’m adopting it. Happy New Year, Broome birding friends! Thanks everyone and may you all “have fun birding” in 2015! I don’t know whyt it is, but the landscape in Australia is immensely fascinating to me – it “feels” so primeval.